[singlepic id=502 w=320 h=240 float=left]On Thursday 15th November 2012, Beverley Joint Sixth took part in the Hull and East Riding regional round of the UKMT Senior Team Challenge. The two teams one from Beverley Grammar and the other from Beverley High school joined 9 other schools and Sixth form colleges at Newlands School for Girls. The event consisted of three rounds where students worked individually, in pairs and in a group of four. Our two teams had their best ever combined results with the Beverley Grammar Team of Simon Choules, Zachary Field, Angus Lamb and Geoffrey Ma who were placed first, just beating South Hunsley (2nd) and South Holderness (3rd). The High School team of Louise Holliday, Eleanor Johnstone, Alex Spafford and Frances Tibble took sixth place. Congratulations to all the students who took part. The boys will now attend the National Final in London on 5th February 2013. On Tuesday 6th November approximately 120 year 12 and 13 mathematicians from the Beverley Joint Sixth took part in the UKMT Senior Individual Challenge. The challenge is a 2 hour multiple choice paper with students using and applying their knowledge to a variety of situations to solve problems. The competition is an international event and the highest achievers are selected to compete for the British Team in the International Mathematical Olympiad. Many universities consider taking part in the challenge as being a key indicator of logical and analytical ability at the highest level. 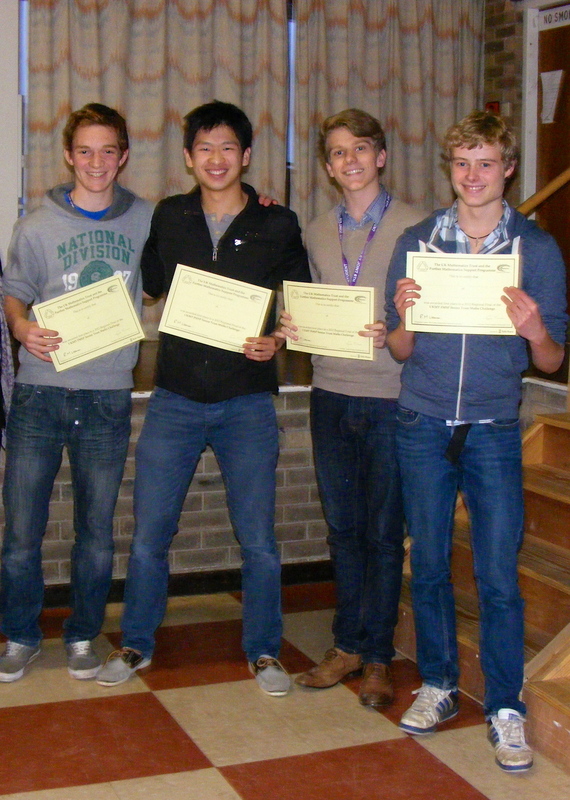 This year saw some excellent results achieved in the senior competition. Zachary Field achieved Best In School and Best in Year 13; Simon Choules achieved Best in Year 12. Zachary and Simon will be taking part in Round 1 of the British Mathematical Olympiad paper – a three and half paper involving detailed written questions. Eleanor Jonhstone, Jonathan Young (both year 13) and Angus Lamb (year 12) will be sitting the Senior Kangaroo paper – a one hour multiple choice. Also, 5 silver and 33 bronze certificates were awarded. Congratulations to all the students who took part.